In late summer, large dark, raised spots may appear on the leaves of certain maple (Acer) trees, especially those of the Norway maple (Acer platanoides). This may be caused by a fungal disease called Tar Spot. It is caused by several different species of fungi in the genus, Rhytisma. If you are looking closely for this disease, you might begin to notice small yellow spots on the leaves starting in mid-summer. However, most people will not see the disease until these have changed into large, dark "tar-like" spots later in the summer. In Norway maples, these spots may reach as much as an inch and half in diameter. When conditions are right, small spots may also occur on the winged seeds of maples. Generally, the spores develop on leaves from the previous year that are left on the ground beneath infected trees. So, one way to help minimize infections is to thoroughly clean up the spotted leaves in the fall. However, if there are other infected trees nearby but off your property, this many have little effect. The spores can be carried in the wind. If the spots really bother you, avoid planting Norway maples which seem to be the most affected of the maples. This is one of those late season problems that really does no serious damage to the tree. The spots do reduce the amount of surface area on the leaf for intercepting light for photosynthesis. Also, in severe cases, leaves may drop prematurely from the trees. However, since the impact comes in the fall, the leaves have already done most of their job for the year and the tree is only minimally impacted. So, from the tree's point of view, no treatment is warranted. From an aesthetic point of view, however, you may have a different opinion. If you are unfortunate enough to have a susceptible maple in a key place in your landscape and it routinely looks awful by the end of the summer, you might consider treatment. 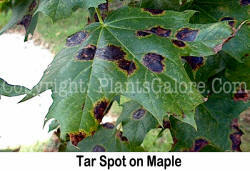 Fungicides are labeled for treatment of tar spot in maple. The challenge in getting control is two fold. One is in the timing of the application. Since fungicides are primarily preventative in action, they must be on the leaf when the fungal spores land. If they are sprayed too late, they will not work and the timing of the spore release by the tar spot fungi can vary considerably. It depends on the temperature, moisture relations and winds as to when a spray would be effective. Second, many of the trees infected by this problem may be quite large. This means that it will be expensive to spray them especially if you need multiple applications to make sure you hit all the spore releases. So, since the plant really does not suffer and fungicide sprays are difficult to time properly and are expensive, it is generally not recommended that you treat tar spot disease.